There aren’t many things that scare me. I’ve been around a time or two and have seen some awful things. Sure, I’m afraid of death, just like everyone else. But, I think I’ve made my peace with it. There are things far worse than death out there. When I wake up in the middle of the night, in a cold sweat, filled with pure panic, it’s not death that’s staring back at me. It is something far more hideous. 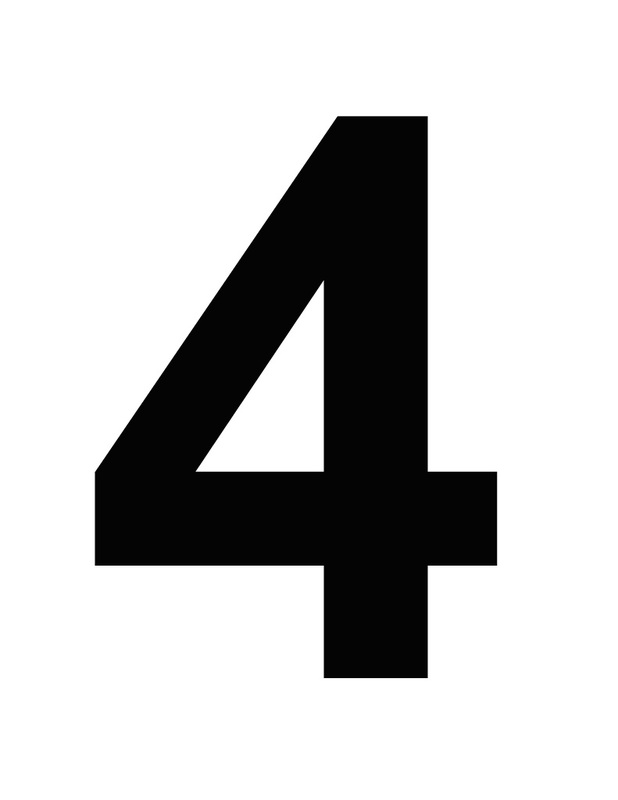 It is the number four. You’ve seen a thousand fours in your life. They are everywhere. Four noble truths, four great elements, four horseman of the apocalypse, four letter words, the number four Bobby Orr, the list goes on and on. What they are used for is not important. It is what those fours ARE that is lurking behind every door, just behind the shadows, just out of reach. It is what those fours ARE that is haunting me. No matter how hard I try I cannot escape. Because, you see, there are plenty of uses for the number four, but there is only truly one four. It is indivisible, it is unstoppable, it is perfect, it is irreducible and it is after me. I try to tell people what’s going on, but they don’t believe me. I explained my predicament friend the other day about my problem and he laughed. He drew the number four on a piece of paper and ripped it up. “Now you’re safe,” he chuckled. Wrong. Wrong. Wrong. Fool! He doesn’t understand. It’s not some absurd, half-witted drawing of the number four that strikes fear into my heart. I’m not scared of what can be done with four; I am utterly terrified of what it is. The perfect platonic form of four. Four in all its grotesque fourness. The ideal four. The world is filled with four imitators, trying to fake fournesss, trying to be useful, trying to help us count all of the pointless presences around us. But, I have SEEN four. The real one. The root of all fourness. And, worse, it knows I have seen it. Oh platonic four, if I could take back that one time my eyes shot open in the middle of the night and I saw you hovering above my bed, I would. Everything was fine before that night. I wandered through this odd fantasy world of illusion that we call life with full belief in the forms that surrounded me. Then, I saw you and was forever changed. I had seen a lifetime of fours, but never any as perfect as this one. In that moment, I understood all other fours to be impostors. They did not have your straightness, they did not have your smoothness, they could not measure up. What my eyes witnessed forever corrupted my being. At first, I looked for the perfect four everywhere. I needed to see it once more. I needed to know it and be connected with its truth. I wanted to be by its side. I wanted it to show me that there was more to this life than incompleteness and wandering. I longed for one more fleeting glimpse of its timeless perfection. A horrible thing began to dawn on me. What if I wasn’t meant to see it? What if my accidental encounter had doomed me? What if the perfect four was looking for me with the same fury that I searched for it? All at once, I knew. I began to sense its presence everywhere I went. It was stalking me. Waiting for me to let my guard down. Hunting me. I was at the supermarket looking at the oranges and suddenly; I saw it out of the corner of my eye. It was hiding behind the walnuts and almonds. Waiting to consume me whole. It sensed my glance and began to move towards me. I dropped my grocery basket and ran out of the store screaming. I didn’t stop until I got to my car. Which was the right key? There it was dashing across the parking lot like a rabid dog. No one saw it but me. It raced towards me. Finally, I pushed the key into the lock, got in the car and sped away. I have been hiding from it ever since. Held up in a dingy motel room passing my final hours. I have this lingering sense that it knows where I am and is toying with me. Enjoying my suffering. Laughing at me. I went through a day or two thinking I could destroy it. I repeated 3 plus 1 equals 5 for hours on end. I figured if I denied the truth of its inevitability I could make it go away. However, my mind is no match for the perfection of its form. A mere string of thoughts could not slow its terrible, astonishing inertia for even a second. I prepared for my final showdown with four. I would wait for it. I would catch it by surprise and break it into a million pieces. I would hit it with a hammer. Shoot it with a gun. Cut it up with a chainsaw. Melt it with a blowtorch. Something. Anything. All resistance is absurd. I know this. Four is indestructible. It has no parts. It is endless and deathless. It wasn’t created and cannot be destroyed. It was here before we were and will be here forever after. If I dropped a million nuclear bombs on the world the number four sustain as much as a dent. It is beyond law, beyond meaning, beyond understanding. Unstoppable. I feel its presence getting closer now. Through the trees. Into the parking lot. Past the couple putting luggage in their trunk. Up the back stairs. Past the ice machine. Outside the door. Inside the door. Across the room from me. Next to me. Inside of me. Finally…. This entry was posted on January 11, 2012, 1:00 PM and is filed under General Weirdness. You can follow any responses to this entry through RSS 2.0. You can leave a response, or trackback from your own site. Think of all the movies with “Four” in the title: Four Brothers, I Am Number Four, The Four Feathers, Fantastic Four, Four Lions, Four Weddings and a Funeral…and on it goes….Fours are everywhere! It is Satan’s mark upon our world. I have found the safety and serenity of hope in the face of four. It’s simple, relatively easy, and yet so complex that most people will never know it. Being of such a titanic intellect (in ALL the meanings of that adjective), I will share it with you. Accept 11-dimension space as reality. Then, four loses all power! HA! “I have found the safety and serenity of hope in the face of four.” Preach on, brother! Oh crap …. finding peace and serenity in Erickson is perfect evidence for your condition. The horrible concept of 4 can be minimized by using Roman numerals, but one can never escape from the reality that 4 is only half of 8, which is truly infinite and unstoppable. Brilliant idea. Unfortunately, there are rumors that the Roman 4 drove Caligula crazy. There really is no escape. Okay, I’ll go away again….. Since my comment yesterday afternoon, I have been infected! Two very obvious 4 incidents, one at the end of a movie (Delhi Belly) and a book (The Snowman) hit me right in the solar fourplex. Poison IV!!!!! You dug deep on that one, Doctor! Intravenous digging is such a fantastic voyage. I knew that. I was trying to avoid the scatological with a clever play in a more bloody vein.